The design reflects demand for greater lift and outreach capabilities. The vessel's equipment outfit takes account of market needs. The ships will have a pair of state-of-the-art rotating mast cranes, with a combined lift capacity of 1,600 tons at 16 m outreach and a maximum outreach of 35 m. The vessel's shallow draft of 6.5 m maintains the small port operational capability that is the basis of the Jumbo fleet. Damen Shipyards Group of the Netherlands. Scheduled for delivery in 2003, the new 11,000 dwt J-1600 class vessels will reportedly be the heaviest heavylift vessels in the world. Co. has ordered two new 5,000 hp tugs scheduled for delivery this year. The first vessel, which will be named Janet M.
McAllister, is scheduled for a spring deliv- ery; the second vessel, Vicki M. McAllis- ter, will be delivered this summer. PTO at 1,800 rpm to Goulds 3410 eight by 10 in. pumps, producing 3,000 gpm deliv- ered to two fire monitors, each with 1,500 gallons AAAF Foam Capacity. Each tug will also be equipped with two NETEC winches holding 475 in. of 10 in. circum- ference line. Lips. The vessel, which is scheduled for a 2003 delivery, will boast podded propul- sors delivering 2 x 7,000 kW at 170 rpm. Main features include integration of a powerful electric drive into a hydro- dynamically optimized pod below ship, resulting in a directly-driven propeller. GUARD® fenders cover you from the tropics to the arctic Seaward International brings to fend- er technology the same rigorous quality control and attention to detail we put into all our marine products. From the 2'x4' to the tanker- scaled 12'x24', all our fenders meet the most stringent quality and performance standards. 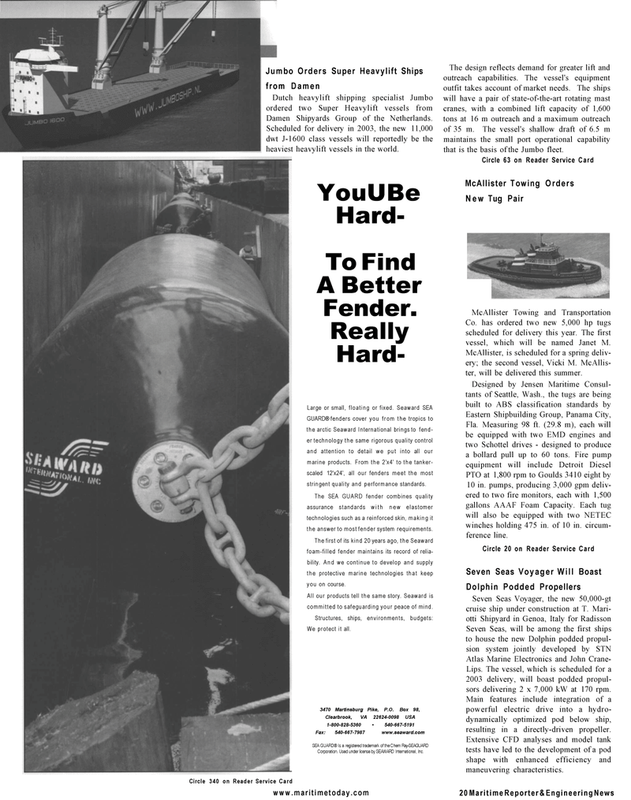 The SEA GUARD fender combines quality assurance standards with new elastomer technologies such as a reinforced skin, making it the answer to most fender system requirements. The first of its kind 20 years ago, the Seaward foam-filled fender maintains its record of relia- bility. And we continue to develop and supply the protective marine technologies that keep you on course. All our products tell the same story. Seaward is committed to safeguarding your peace of mind. Corporation. Used under license by SEAWARD International, Inc.